At Chaparral Veterinary Medical Hospital Center, our veterinarians are dedicated to your horse’s health on a holistic level, from their dental health to their internal health, down to their feet. 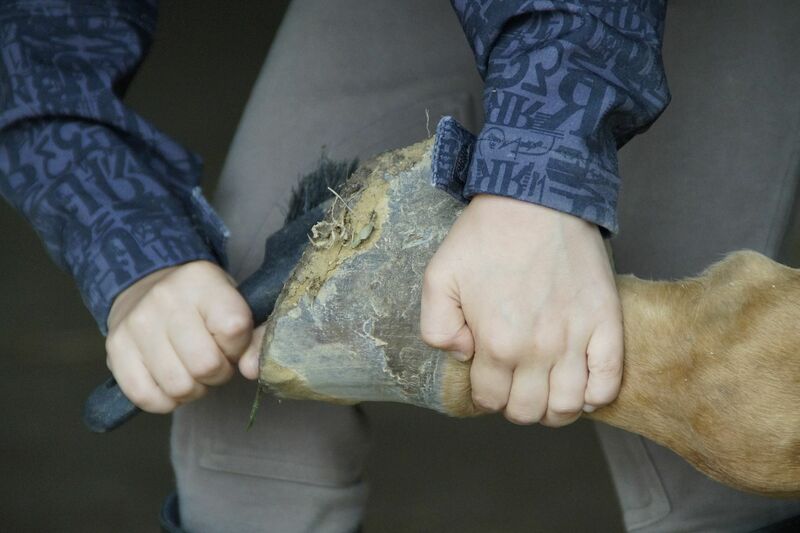 One way to ensure your horse stays physically healthy is by making sure its hooves remain in good shape. Your horse’s hoof health and shape directly correlate to its overall health, and the tasks it can complete. Anyone who has owned horses for a long time will know that a poorly working hoof has the power to harm your entire horse. Alternatively, a healthy functioning hoof has the power to revive the entire horse. Unlike other pets, your horse’s feet require special examinations to assess the health of its hoof structure. A lot of factors can impact your horse’s hoof structure, including its breed, age, genetics, and nutrition. With that said, equine sports can put a lot of stress on your horse’s hoof, especially if your horse is not receiving proper podiatry care. At our equine podiatry center in Cave Creek, AZ, our veterinarians will work in collaboration with your farrier to guarantee your horse’s hooves are staying healthy. We will also offer recommendations on ways you can keep your horse’s hooves healthy based on its internal and external structure, shoe, and lifestyle. A big debate amongst farriers, equine veterinarians, and horse owners is the idea of whether horses should be shoed or remain barefoot. There is a variety of personal opinion and clinical research that goes into this question. However, both practices have their unique pros and cons. Whether you decide to keep your horse shoed or barefoot will depend on a variety of factors. In some contexts, horses can live and work safely without shoes. However, this is best determined by a equine vet with the help of the horse’s owner. Horses whose hooves are trimmed to avoid abnormal wear and injury with good hoof and leg conformation along with a light workload are more likely to live safely without shoes. If you’ve decided to have your horse’s shoes removed, your horse’s hooves might be sensitive to rough terrain immediately after shoe removal. It’s a good idea to give your horse some time to heal and callous before taking it on rough trails. It’s also important to continue to properly maintain your horse’s hooves by examining their activity levels and bringing them to the vet for routine check-ups on their hooves and joints. Barefoot horses need to have their hooves trimmed and checked about every six weeks. While wild horses have grazed and walked over rough terrain for years, the horses we own today are bred and domesticated for a certain lifestyle. Oftentimes, this lifestyle requires horses to stay shoed. Domesticated horses don’t graze for food over long distances, meaning that the lack of continual stimulation the soles of their feet makes their hooves weaker than those on wild horses. Domesticated horses are also used to more leisurely terrain, like stall bedding, asphalt, and arena footing, causing modern breeds to lose the strength and conformation in their feet. Other factors play into hoof problems and the fragility of modern breeds, like diet, climate, and lifestyles. Domesticated horses play a variety of roles in our lives. Stable horses are subject to workloads and different conditions, in which they are bred for size and strength, without also breeding for the quality of the horses’ hooves. Equestrian sports require horses to move at powerful forces and speeds, which can also put stress on horses hooves, legs, and joints. In these situations, properly designed shoes can remove some of the stress and protect your horse’s legs and hooves. Horses that have to carry more weight, run quickly, and jump higher can maintain a healthier gait when they are correctly shod. Choosing an experienced farrier and veterinarian podiatrist can help you find the right shoe for your horse’s activity. In fact, proper equine podiatry can treat other orthopedic disorders in horses, like laminitis, navicular disease, contracted heels, ligament injuries, and tendonitis. Want to learn more about equine podiatry? Call Chaparral Veterinary Medical Center today at 480.595.8600.